When you turn the pages of the Optima evolution and reach the first generation Optima and the one we are talking about today, it’ll be hard for you to believe the development journey this Korean nameplate travelled by the time it brought its fourth generation Kia Optima 2016 at the 2015 New York Auto Show. 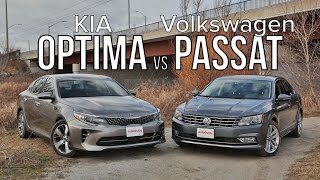 The Optima indeed has got better in just any department you talk off for the model year 2016, with its sporting evolutionary design which surely will knock the inspirations from Sportspace Concept. This Fourth Generation Sedan undoubtedly takes the brand’s styling up a notch and gifts you a mid size sedan with restyled interior accompanied by premium features. To find out more upon this let us begin the cycle in a well organized manner. 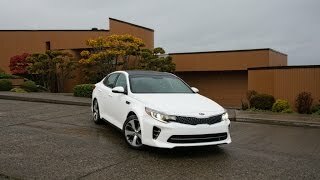 Beginning with the brief outlook to statistics we’ll further talk about the descriptive, Interior, exterior and the also the new Big news Drivetrain or call the performance of Kia Optima SX 2016 holds. 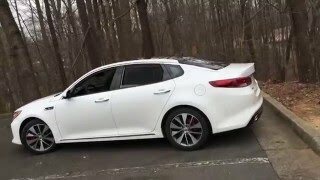 Let us look at the detailed work out the team Kia Optima SX put on shore to bring out this 2016 model. The mesmerizing metallic touch, make the new Optima’s interior a nice place to be in. The redesigned interiors are nevertheless both larger and more comfortable, in comparison to its predecessors. 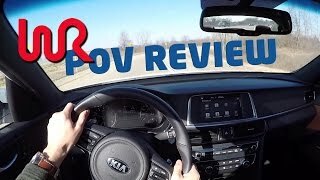 The interior this time with new Kia Optima 2016 has brought in features which you will find in the luxury vehicles which are far above the price of this model in particular. The center stack has been presented with a cleaner design and the sporting fever buttons and knobs add an invincible taste to it, giving the positive feeling a new height. Looking at Interiors another thing noticed is that a huge attention has been given to the comfort part also. The stiffer seat frame so used reduces vibration, while both the passenger and driver seats are well designed for comfort with addition like they are, heated, ventilated and power adjustable. The two new interior colors Rich Merlot and Dark Aubergine make the model precious in terms of luxury offered (not in price though) while one major thing you can notice, which till date was just offered in premium sedans is, the height adjustable front seats. In all we would say the team has commendably worked upon the Interior of 2016 Kia Optima SX. The redesigned headlamps move effortlessly and soothingly with the reshaped ‘tiger nose’ grille, which now is both wider and narrower. Combined together the Grille, fog lamps and the headlight makes the front fascia of new Kia Optima SX 2016 more aggressive. The new taillights in this model equipped with LED technology and the crisper character lines adding to the trunk lid features make the exteriors combined more attractive. From its third generation sedans, the Kia here as well continues to offer the naturally aspirated 2.4 Liter four-cylinder and the turbocharged, as well as the six-speed automatic transmission. However the engines have been backed up for better fuel efficiency and with a minute drop in power and torque. Though we personally believe the fall isn’t much to be noticed in a mid size sedan. However you can expect a power sprint of 0-60 to come a little slower for the engines, precisely 8.5 and 7.2 seconds respectively. Apparently Optima’s engine lineup has a new join with the 106 Liter turbocharged four cylinder for the Kia Optima 2016 model. Saying that the unit is similar to the one offered in Kia Forte and Hyundai Veloster. Though till now, there isn’t any fuel consumption rating revealed. 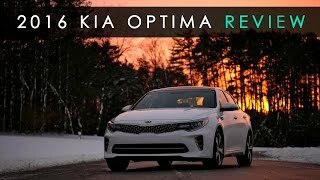 In all the new Kia Optima sounds a good hand to go for those looking for a mid size sedan from the family in particular. However it is expected that the competition for the model in market prevails with the presence of Ford Fusion and Mazda6.